Are you searching for information on do it yourself wood fence installation? Enclosing your yard with a wood fence can add beauty and privacy to your home as well as improve the property value. Learn an easy method to build a fence. You don't need to hire a professional to install a basic wood fence. With the right research, do it yourself wood fence installation is even possible for a beginner. As you plan out your fence, check if there are any local regulations or ordinances regarding residential fences that affect your property. Ask the local utility companies if there are any underground cables and pipelines in the area where you plan to place the fence. This will help you plan where to safely dig. Make sure you know exactly where your property lines end so that you won't accidentally infringe on a neighbor's property. It is also wise to talk to neighbors about your fence plans to avoid any potential property line conflicts. Sometimes one fence divides two properties and neighbors should be in agreement about the fence placement. Measure each fence post and panel to make sure that the planned area will accommodate it. Determine the area that you want fenced in. Place a grade stake where the fence will begin and another where the fence section will end to mark the area. Next, stretch mason's line from the starting stake to the ending stake so that you have a straight, tight line. Using the line as a guide, follow fence manufacturer measurements and use the tape measure to estimate each post placement. Put a stake where each post will go. Remove the string after stakes are in place. Dig hole for the first fence post. You can use a shovel to dig, but a post-hole digger or post-hole auger will make digging easier and faster. Periodically use a tamper tool to loosen soil and widen the hole as you dig. Make sure the hole is large enough for the fence post. Most fence posts are 20 inches deep, but the hole depth will depend upon the fence instructions. The hole should be 10 to 12" wide and 6" deeper than needed. Fill the hole with 6" of gravel, which will help drain water away from the post. Put the fence pole into the ground so that 1/3 of the fence pole's length is underground. Make sure the post is plumb (at a 90 degree angle). Nail two 2x4 pieces of wood to each side of the post to hold it in place during the cementing process. Attach the end of the 2x4 to a stake in the ground. This will create a sturdy brace for the posts as they cement overnight. Verify that the post is still plumb and level. It may help to have someone hold the post to keep it straight while you are putting the 2x4 braces on. Follow the ready-mix concrete manufacture directions to prepare it. Mix the concrete with a hoe in the wheelbarrow. Fill the hole with concrete. Make sure the post is still level and plumb. Follow steps 3-7 to install the rest of the fence posts. Always install the end and corner posts first to help you keep track of the fence layout. Let concrete set overnight. After the concrete is set, remove the temporary bracing 2x4s. Tie mason's line to each post. Use the string level to adjust the string to the appropriate level mark on each post for the panel installation. Use a carpenter's pencil to save the spot. Remove the string and string level after marking the spot. Skip to step 12 if you are using preassembled fence panel. Nail the backer rails to posts following the manufacturer's instructions. Placing a board under the backer rail can help hold it in the correct place while nailing. Use the tape measure and level to make sure that the rail is in the correct place. Use 8d or 10d box nails to install pickets to the backer rails. Every three or four pickets, recheck the level. If you plan to make gaps in the pickets, cut a board to the desired gap shape to use as a temporary spacer between pickets as you work to make sure the gaps are the same size. To attach preassembled fence panels to posts, use 18d or 20d nails to secure the paneling. When working with such large nails, be careful not to splinter the wood when hammering. Measure the level as you attach each panel to make sure each panel is in the appropriate uniform placement. 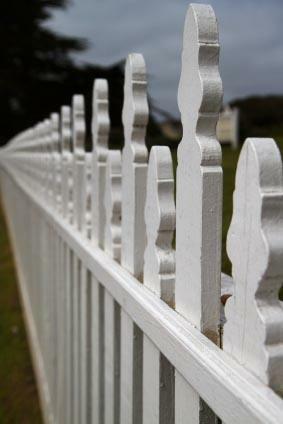 If you are replacing an old wood fence, you must remove the old fencing first before installing a new one. A worn out fence may be relatively easy to pull out. However, if the fence has a concrete base, it will be necessary to dig the base up to remove the fence posts. Pre-treat the wood fence to protect from environmental damage before installation. This will prolong the life of the fence. A do it yourself wood fence installation is a proud achievement for a homeowner. Enjoy beautifying your home.